This past week has been cold. Sub-zero, in fact. The cold weather is something that us Brits are ultimately unprepared for. We crumble at the sight of snow and go weak at the thought of venturing outside. We’d all much rather stay home, snug with the central heating cranked up and a hot cup of tea to warm our hands. But what if your house is cold? How can you make sure you have a warm home for those cold winter days? Well, pop the kettle on, cosy up with the heating on and let’s talk all about new radiators and keeping your house warm for winter. This winter my house has been a chilling 6 degrees celsius max. When moving into my house, I hastily ripped up the carpets before being able to afford to lay new flooring. Team those bare floorboards with old radiators and you’ve got yourself one very icy home. The old electrical fire also didn’t work. Naturally, I tore that out and installed an 8kw log burner instead (more on that later). Whilst the log burner might be hot when it’s fired up, it also eats up a lot of logs (read: money!) so it’s not something I get to use that often. So, what’s a girl to do? Well…first, she’s to attempt to bleed the old radiators. Only to find that 4 out of 6 radiators in the house are so old that the valves are rounded off. Then, she’s to go on a mission to get a couple of new Quinn radiators (newly known as Barlo radiators) to help keep her house warm whilst also being as energy and money efficient as possible. 1. HOW MUCH HEAT DO YOU NEED? Before you even start thinking of what colour or style of radiator you want, you need to know if it’ll have enough power to heat the room. So many factors can influence the heat requirements from the size and layout of the room, if the windows have double-glazing and what level the room is on. Before starting my research, it didn’t even cross my mind that different radiators have different heat outputs. I guess it’s just not something you consider on a daily basis! The heat output of your radiator is measured by BTU. Before I get all mathematical on you (like I would…) you can use the handy heat calculator by PlumbNation to find out what heat output you need. The heat calculator also gives a list of recommendations based on your results – perfect, if like me, you haven’t the wildest where to begin on your hunt for a new radiator! A higher BTU does mean your radiator will require more energy to heat the room. But it’s better to be safe than sorry. It’s likely you’ll be thankful for a radiator that can kick out some heat on those really cold winter days! 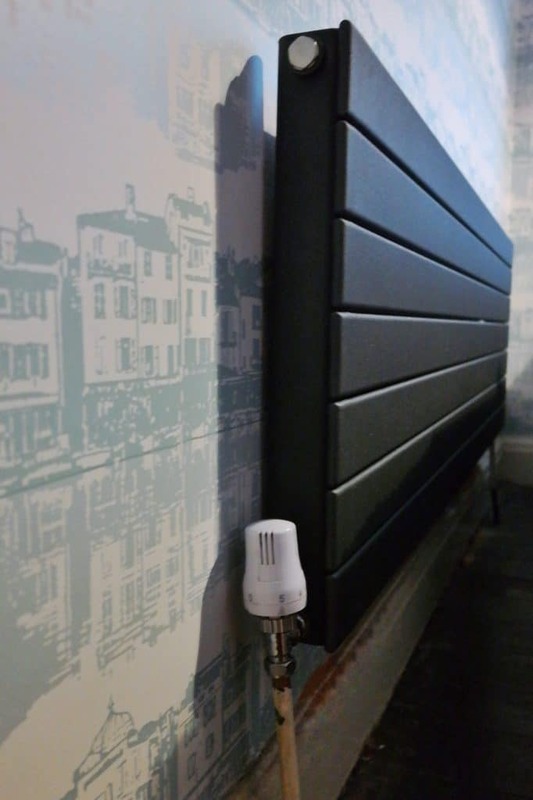 You can also install thermostatic valves to give you control over the temperature of the radiator or turn them off completely if the room isn’t in use. Thermostatic valves are pretty common and it’s no surprise as they’re a great way to conserve a little extra energy and money. 2. WHAT SIZE RADIATOR SHOULD YOU BUY? Who knew radiators come in so many different shapes and sizes? From horizontal to vertical and long or skinny, there’s a huge variety of radiators out there. 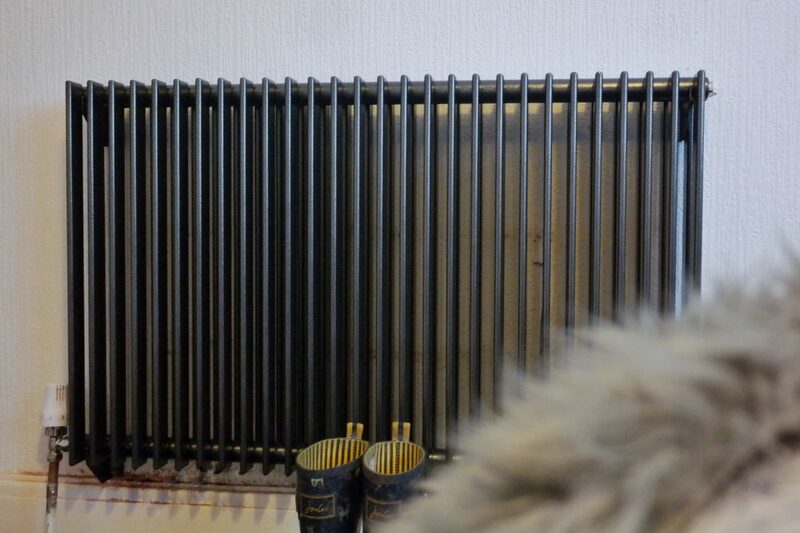 When choosing new radiators, I wanted the job of fitting the radiators to be as cheap as possible so I opted for new radiators that matched the dimensions of my existing radiators. That way, the plumber could do a simple swap instead of replumbing or moving around any pipework. But, if you’re happy for the extra plumbing work to be done – it might be worth thinking of different sizes. A taller or longer radiator will likely give out a lot of heat making them perfect for larger rooms. However, you could also get a compact but deep radiator that has just as much power, without taking up so much space along the wall. Think about where the radiator is in comparison to the rest of the furniture and the function of the room, to help decide what size radiator works best for you. Vertical radiators are also a great way to save space but still keep the room nice and toasty. My landing currently lacks a radiator and my gosh, can you feel the difference. Stepping out of the front room into the hallway feels like stepping into the Arctic. My only reasoning for why the previous owners never installed a radiator in the landing is because there’s a lack of space. However, a vertical radiator would fit perfectly so it’s safe to say I have a vertical radiator high on my to-buy and to-fit list. 3. HOW DO YOU CHOOSE THE RIGHT STYLE? As well as being lots of different size radiators, there’s also a seriously impressive range of styles out there. From ornate Victorian style radiators to sleek, modern ones, it’s hard to know where to begin. Those dreamy Victorian radiators tend to be made of cast iron which whilst it may be pretty, it can be quite expensive to heat. With that said, cast iron will keep its heat for longer once the radiator is turned off. If the Victorian look is something you seriously want, you can also get steel versions. 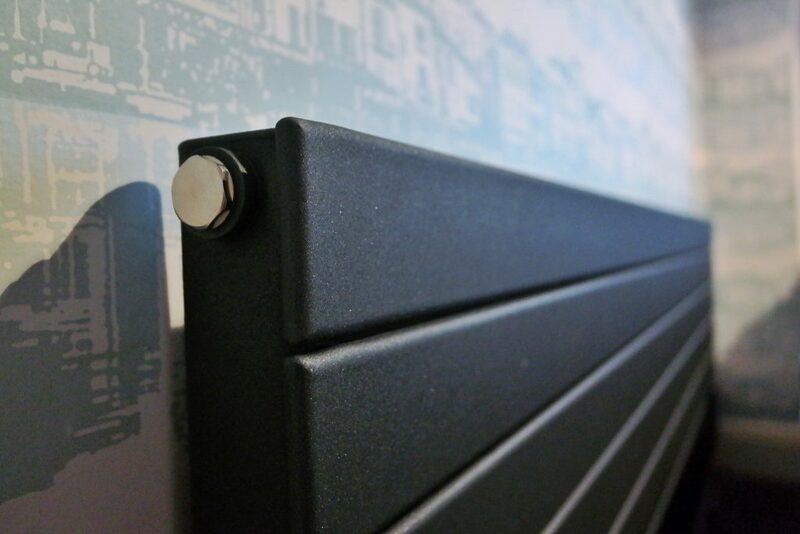 Steel radiators are good conductors of heat and easy to maintain, making them an all-round good choice of radiator. They also come in a huge range of colours and styles. 4. SHOULD YOU CHOOSE A PANEL OR COLUMN RADIATOR? Oh and let’s not forget that there’s also single panel, double panel and column radiators to think about. For the front room, I opted for the single panel Quinn Slieve H11 horizontal radiator. 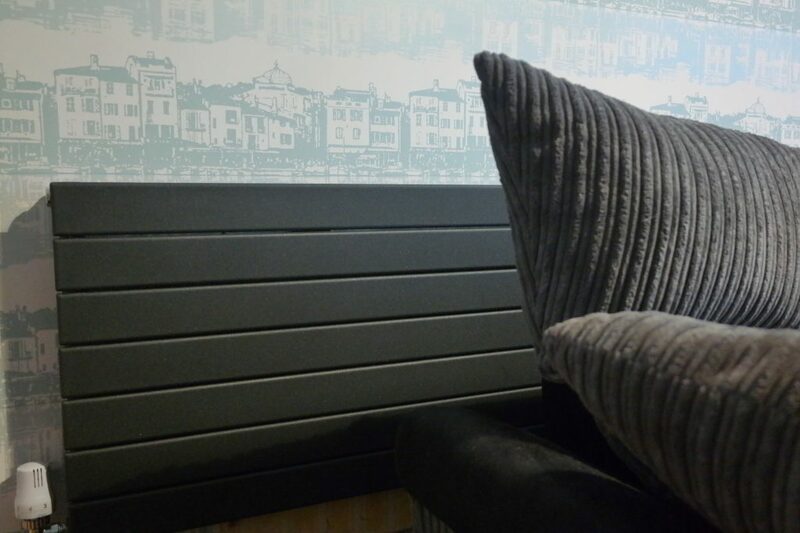 The slim and modern design of this radiator was perfect for my front room. Due to the layout of my front room, the radiator sits behind the sofa. Having a slim radiator allows me to create space between the radiator and the sofa without losing any valuable floorspace from the rest of the room. My old radiator was a double panel, less than aesthetic, white radiator. Although my new radiator is only a single panel, it does have convector fins, ensuring it kicks out enough heat to fill the room. So don’t think bigger always means better. This slim, modern radiator does a grand job at heating my front room whilst looking the part too. When I’m not in the front room or the kitchen, chances are I’ll be in my bedroom sleeping. My sleep is something that I value so having a warm bedroom is pretty important. For my bedroom, I decided to go with a column radiator. The rest of my bedroom is far from decorated. The textured wallpaper, lackluster carpet and beech wardrobes are most definitely not here to stay but they’ll do for now. I have visions of creating a dark, moody and cosy space for my bedroom. One that has eclectic vibes and lots of character whilst still remaining chic. For those reasons alone, I knew a column radiator would be the perfect accompaniment for the bedroom of my dreams. I chose the Quinn Adagio D35 column radiator. It leans towards that ornate Victorian style that I find myself drooling over yet remains modern and timeless thanks to its simple, attractive design. 5. WHAT COLOUR RADIATOR DO YOU WANT? Yes, you did read that right. Radiators come in a surprisingly wide range of colours. You don’t have to just go for the standard white colour. If you’re going to spend a bit of money installing new radiators, you may as well have some fun with it, right? Although radiators are an indispensable, functional appliance in your home, that doesn’t mean they shouldn’t have a bit of character. When it comes to decorating my house, one of the most important parts to me is adding touches of personality. I want someone to walk into my house and instantly know it’s mine. Quinn radiators are available in a full spectrum of colours. Although I’m currently crushing hard on all things yellow, it’s probably not a colour I would choose for my radiators. But if I really did want to make a statement and go bright, I could. Quinn offer a bespoke service where if you really are after something bold or special, they can find the ideal colour for you. They design radiators in whatever RAL or BS colour reference required – that’s over an incredible 200 colours! Let’s not forget they also have a choice of 9 special finishes and textured paint options too. If, like me, you’re terrible at making decisions, then Plumbnation are on hand to help their customers find the perfect colour match. With a lead time of 3 weeks, it’s well worth considering if you want to go that extra mile for your radiators. I, however, played things safe and chose from their standard finishes. My radiator for downstairs is in a matt charcoal finish to perfectly complement the log burner, grey walls and grey furnishings. I also plan to eventually wave goodbye to the little blue houses and swap them for a metallic grey Venetian plaster and just knew, the matt charcoal radiator would look amazing against that grey plaster wall. Upstairs, I kept the grey theme running. As mentioned, I haven’t yet decorated the bedroom but when I do, it’ll be going dark so I wanted a radiator that would blend in with my proposed style. Not too dissimilar from my downstairs choice, I wet for a gunmetal finish for the Adagio radiator. This slightly lighter tone will be an ideal, subtle contrast to whichever dark grey I choose to paint the wall it lays on. Installing new radiators had an instant positive effect for my house. It’s clear that the old radiators weren’t good enough for the job. There are many ways you can make your home energy and heat efficient but having the right radiators, is definitely one of the important factors. Since installing the radiators, the temperature of my house has jumped from 6 to 13 degrees already. Because my new radiators have been specifically chosen for the room and give off the right amount of heat, I’m using a lot less energy than I was before. I can warm my house for a fraction of the cost of what I was originally spending trying to get my radiators to just warm up. If you haven’t experienced waking up and seeing your breath every morning for the past two months, you might not realise just how happy this makes me! PlumbNation currently have an offer on Quinn radiators so if, like me, you’re looking to keep your house warm this winter then I highly recommend you check them out and grab yourself a bargain. 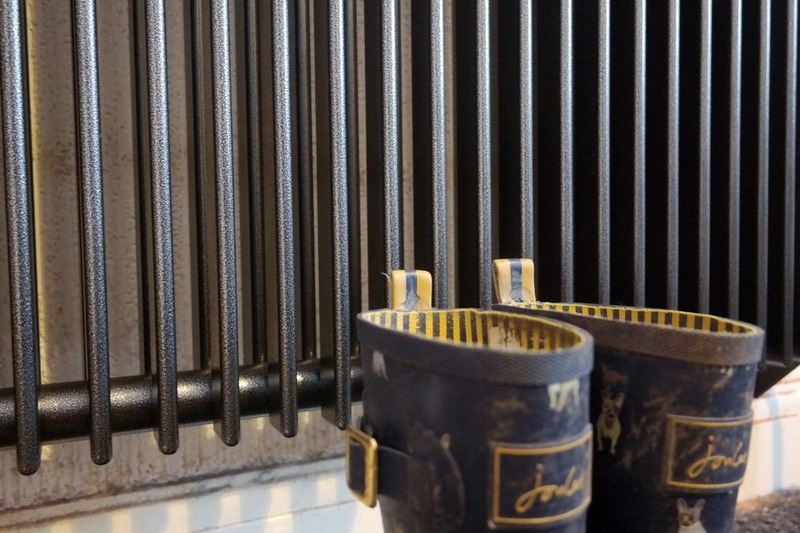 Not to mention, the radiators are pretty stylish too, if I do say so myself! 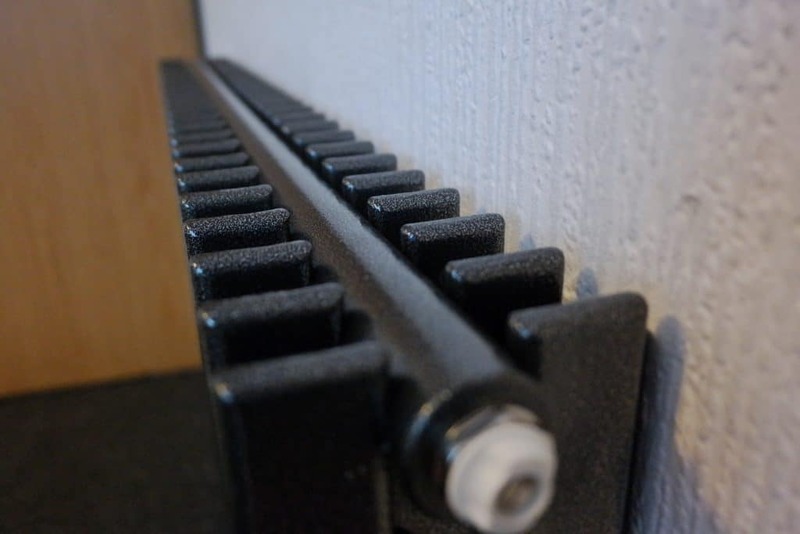 I’ll be honest, you lost me after ‘valves were rounded off’ BUT I know that when I have my own home I can come back to this post and re-read your tips for the most efficient and economical radiators, so thankyou for putting all the in one handy post! I wouldn’t mind having some gorgeous Joules wellies like yours in my house either! Hahahaha…my DIY knowledge is constantly growing. The joys of being a stubborn madam who ‘don’t need no man’ and will get stuck into anything (then eventually give up and call a plumber). Thank you lovely, I’m hoping it makes sense to a few people and helps them on their home-owning journey too. Ah the Joules wellies are so cute and not to mention mud-covered, oops. I hope you get to treat yourself to a pair one day. Maybe ask for some for your birthday? I heard you were struggling to think of ideas :)!